Andrew Hewkin, international renown artist resides at Saint Peters Bay. Upon touch down in Bridgetown we “snowbirds” anxiously waited for the doors to open…armed with our Ray Bans, sunhats and enthusiasm we proceeded to descend the staircase onto the tarmac where we were greeted with a brilliant welcoming sun, a warm, sensual breeze and a brilliant broad Bajan smile! “Welcome to Barbados” exalted our greeter/driver, our tour guide and our instantaneous new friend! This was our introduction to what turned out to be one of the most enjoyable times we have ever spent away from home. The next seven days was to be heaven on earth with wonderful, warm people, glorious accommodations, and loads of exciting activities, historical visits, and fab shopping all packed in between bouts of R&R, massages, great food and rum punch! … our adventures continue on this spectacular island, including a private viewing of the works of world renown artist Andrew Hewkin exhibiting right here at the resort, a steady stream of mouth-watering Bajan culinary specialties, a Bajan roof-top aerobics class, and awesome shopping with stunning diamonds…and lots of them! Best of all, all captured with the acute lens of Celebrity Stylist and Photographer Korby Banner! A regular contributor to PIE Bookazine, (a mini-Vanity Fair) Korby is internationally known for his “Style by Jury” TV show airing in over 40 countries in eight languages. 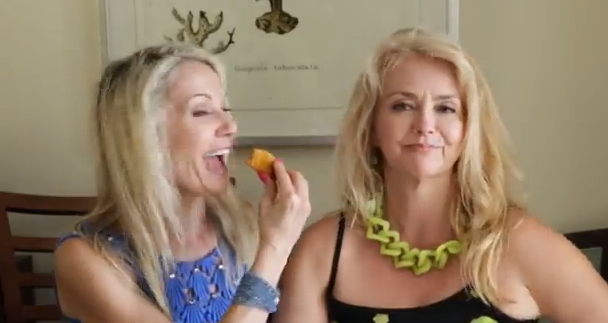 We are so gifted to have the “gift” of Korby’s talent to make us look and feel our best! 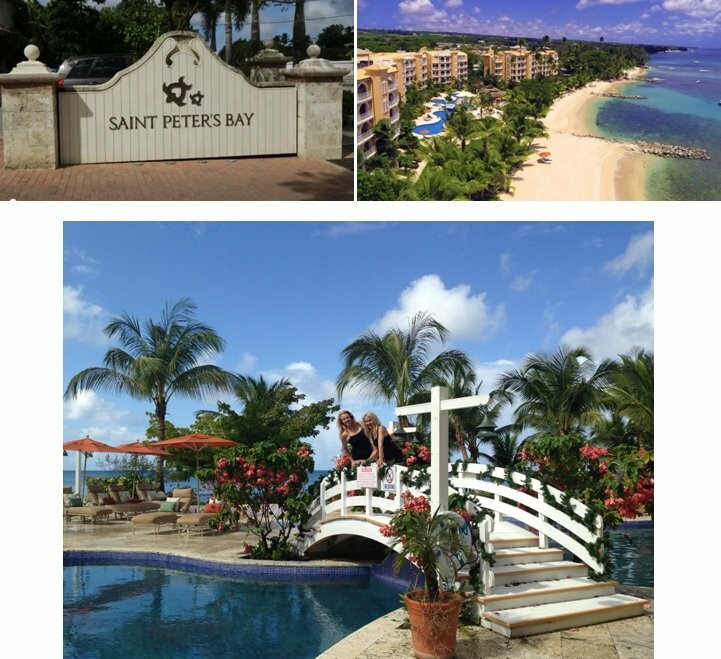 Saint Peter’s Bay draws the best of the best…. Andrew Hewkin, international renown artist, with his works hanging in personal collections of Sir Michael Caine, Jack Nicholosn, David Bowie and members of royalty, discusses a piece hanging here in this stunning space, the penthouse. This piece is one of over 45 incredible works of art which make up this exhibition “Revisiting Barbados”. This piece showcases the fabric of the many different people that live on the island that Andrew has come to know, with individual eccentricites, a colourful joyful community, so easy to be around and enjoy. Another piece, very dear to Andrew’s heart, a journey that took three days to travel to. Here in Papau New Guinea over this rickety bridge he traversed, safety at risk…. the final piece is stunning. This exhibition showcases Hewkin’s stunning interpretation of the social and ecological changes he has observed over the last forty years in Barbados… and captured on his canvases. The “Barbados Revisited” exhibition. This exhibition is hosted in association with Chattel House Realty. 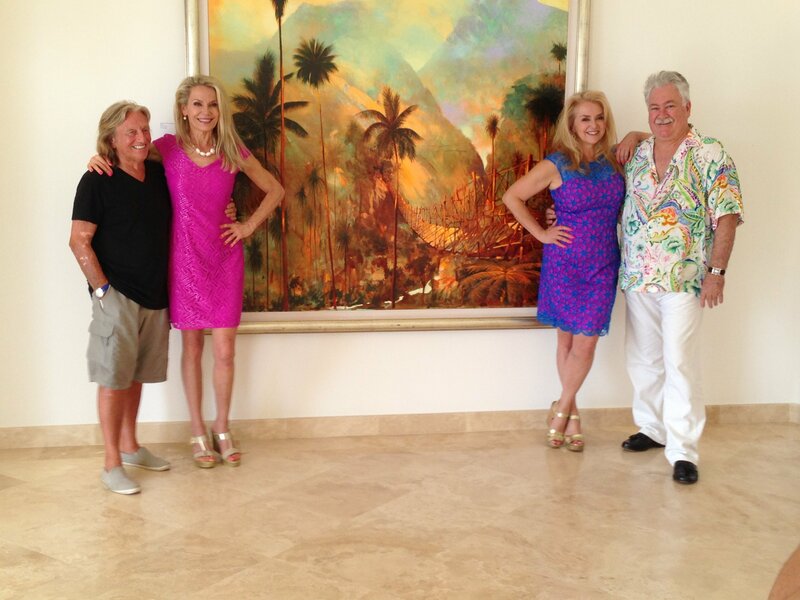 Thank you to Jeremy, the paintings were captivating, thought provoking and set in one of the most beautiful venues ever… over looking the turquoise sea, white beach and kalidoscope of flora and foliage below. Executive Chef, Anthony Junior strikes again… we are treated to a lip-smacking, delish luncheon, Bajan specialty dishes served up on our patio overlooking the stunning gardens, lagoon-like surrounded pool and overlook to the Caribbean. Chef Anthony is available upon request to come and cook up a storm for you, your family or a party, exclusively for residents and guests of Saint Peter’s Bay resort. Be sure to book him in advance, and sit back, sip on a rum punch or a glass of wine while he whips up delectable dishes before your eyes. Flying fish, poached with a melody of spices, herbs and vegetables, served up with breadfruit (likened to our traditional carbs, potatoes, pasta, rice etc…) with veggies a la carte. Flakey, flavourful, and fancy… a beautifully presented meal and delish to boot! Oh, and we CANNOT forget the pumpkin fritter! So so good, a specialty of Barbados. Georgia stashes one away…. and presents later! Hey… where’s my fritter? Although we quickly recognize Saint Peter’s Bay Resorts and Residences may be a place where the rich will play, it is clear to us, that everyone here seems to be grounded… you see no-one seems to pay too much attention to the brand of your bag or what’s on your wrist. That must be how the phrase “flip-flop millionaire” came about here at Saint Peter’s Bay. There are no pretensions, refreshing, down to earth yet with first class, full service amenities, that’s what it is all about here. Now that’s not to say…. 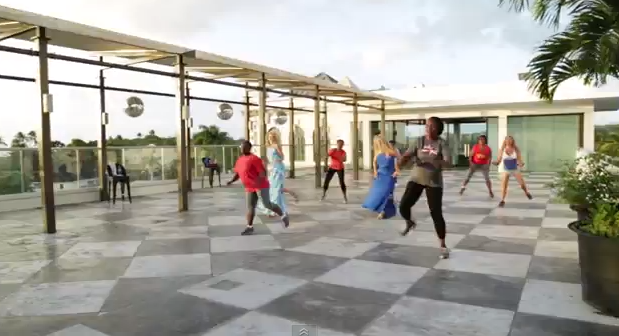 that Limegrove Lifestyle Center does not beckon…. 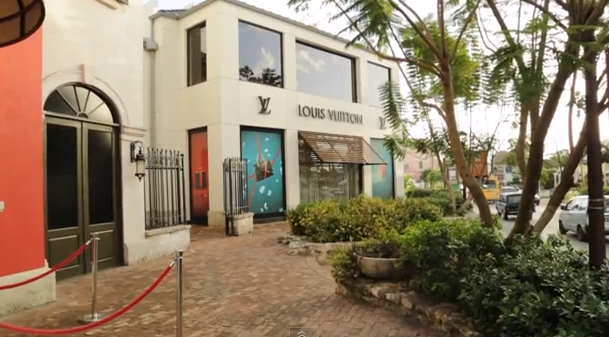 Limegrove Lifestyle Center is a very stylish place to not only shop, but dine as well. And not only that, if your timing is right you might just catch on the roof-top a high-wattage, extreme aerobics class going on! That’s what we did… and we joined in, in our long dresses, and no-one skipped a beat! Limegrove Lifestyle Center has a unique blend of both local and international boutiques, delis, cafes, gourmet foods and an art gallery all situated in a setting built around three unique courtyards. A beautiful, fun, energetic and exciting place to take in a drink, a meal or perhaps seek out a Cartier piece or diamond ring? Here we are engaged with the enthusiasm and knowledge of Roland… who shares with us from the “Love Collection” the “Love bracelet” with a lock… a real lock that can be opened exclusively with a special key (a sort of screw driver). This special key is kept around the neck of another as a symbol of their commitment to one another. How romantic! As if we have not seen enough diamonds… our next stop is a show stopper! Diamonds International with Tedson… who had a fright when we took flight…. Alas, no Crown of Light Diamond for us, Tedson is not giving away any free samples today… darn! We thank Tedson for sharing with us the science and the beauty of these amazing rocks and head out to the courtyard to enjoy a rum cocktail and take in the brilliance of the sun! For FREE …. yipee! What a glorious week we have had here in Saint Peter’s Bay, from the sun, to the sea, the people and the beauty and variety of sites, activities and historical tours we have enjoyed on the island. 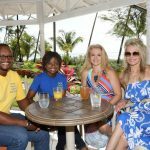 Thanks to our host Saint Peter’s Bay Resort and Residences, where every moment was memorable in the most beautiful, relaxing and invigorating home away from home, where our every wish was granted…. We’ll be back! Many thanks to everyone that made this all possible! 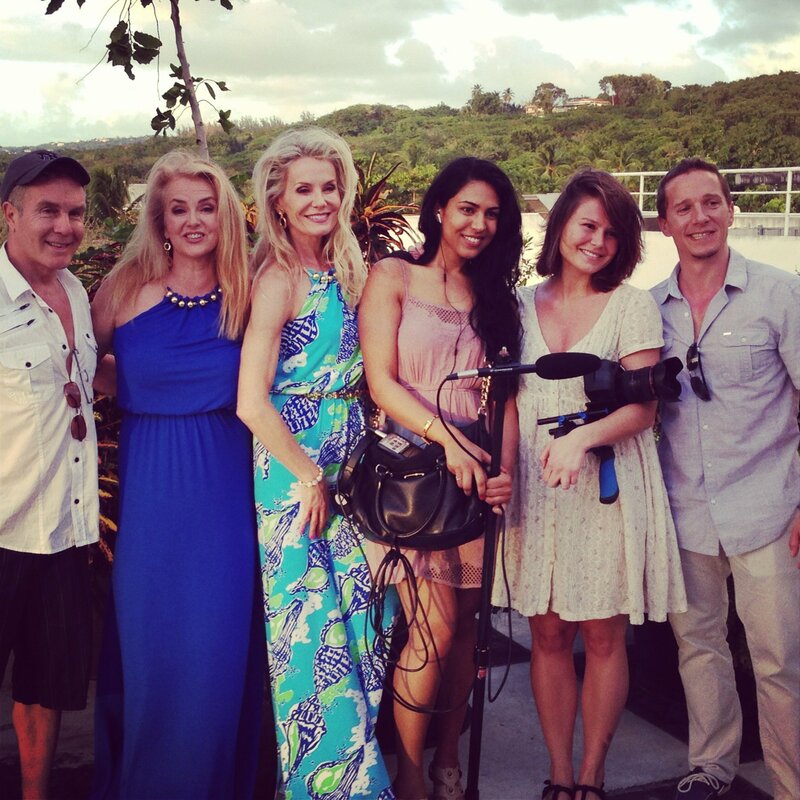 Thanks to our entire film crew! The Wine Ladies wardrobe provided by Island View Lilly Pulitzer and jewellry provided by Pretty Thingz our partners in Canada. our media partners PIE Magazine and make up artist & photographer Korby Banner.